The DCP-J125 is a sleek and stylish All-in-One ideal for the home or student user. 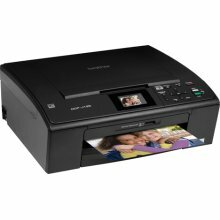 You can print photos directly from your digital cameras media cards. 1.9 color LCD display located on the control panel is perfect for viewing images and easy menu navigation. High quality photo printing with vivid, borderless photos up to 6000 X 1200 dpi. This model also includes powerful scanning software that captures and organizes your documents and images in various formats. The flatbed copier makes it convenient to copy bound, thick or odd sized documents. Help save money with the 4-cartridge ink system by only changing the cartridge that needs to be replaced. Photo Printing on Demand. Print photos on demand from your media cards. 1.9" Color LCD Display. For viewing images and easy menu navigation. Fast Color Printing. Print speeds up to 33ppm black and 27ppm color. Professional Printing Resolutions. Vivid, borderless photo printing up to 6000 x 1200. Versatile Scanning Capabilities. Easy to use scanning software and ability to scan directly to your media cards. Flatbed Copying and Scanning. Flatbed copier makes it convenient to copy bound, thick or odd sized documents. 4-Cartridge Ink System. Only replace the cartridge that needs to be replaced.